Want to eat more fish but need a little nudge? 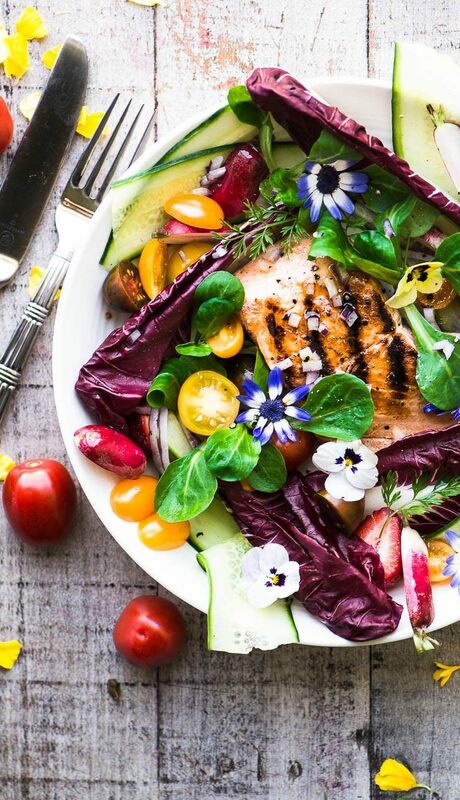 This Grilled Salmon Salad with spring greens and edible flowers is one of my favorite ways to eat fresh fish like salmon, ahi, or halibut. This meal is low carb, gluten free, paleo, whole 30, Weight Watchers friendly, and really satisfying. It's dang pretty, too. Heat a grill pan on medium high for several minutes so it gets really hot. Brush the salmon with olive oil, and season with salt and pepper on both sides. Sear the fish for 3-6 minutes on each side, or until it flakes easily with a fork. Set aside. Arrange the lettuces and veggies in a wide shallow bowl, and place the fish in the center. Garnish with edible flowers and fresh herbs, if you like. Drizzle with dressing just before serving. For the dressing, whisk together the oil and vinegar with the other ingredients to taste.